During the next few weeks, we will be learning how to use electronics with a raspberry pi, and how to code the raspberry pi to run an electronic circuit. Click on the following tabs below to view what we have done in the previous session. In the first week, we will learn how to build a basic electronic circuit using an LED, Resistor and a Pi. 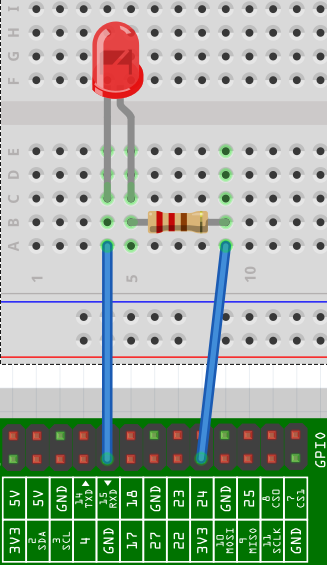 Connect the positive leg of the LED to one leg of the resistor. Can you find out how to code and wire up a button to an LED light, so when the button is pressed and only pressed the light will start pulsing? 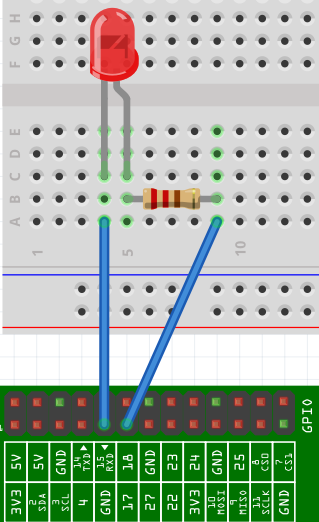 Can you make the same LED pulse when the button is pressed until the button is pressed for a second time? Can you make a traffic light sequence with 2 sets of lights and a pedestrian light? Can you make the road lights turn red and ped lights turn green when the button is pressed? Can you make the same traffic signals but with a ped button?